An updated report published today (28 Jan) by PACTS confirms ‘the lack of progress in reducing deaths on UK roads over the past seven years’. First published in 2015, ‘Road Safety Since 2010’ has been re-released to include the 2017 casualty data. The PACTS report shows that while UK road deaths in 2017 were substantially (37%) lower than in the period 2005-09, there has been ‘virtually no progress’ since 2010. However, taking population growth into account, the number of road deaths per head of population declined by 8% for the UK between 2010 and 2017. 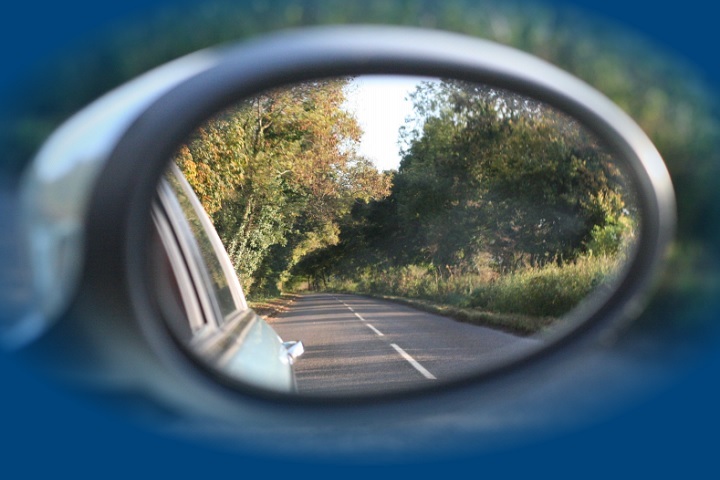 This means that, from an individual road user’s perspective, the risk of a fatal injury has reduced. The report discusses the Government’s refusal to adopt national road safety targets in England – as has been done in Scotland, Wales and Northern Ireland. PACTS says these three countries are making ‘good progress’ and that it is widely accepted that targets have helped to ‘drive the road safety effort in these jurisdictions’. However, PACTS acknowledges that casualty figures do not demonstrate ‘differential progress’ as a result of having targets. Based on its analysis, the PACTS report urges the Government to take bold measures, at national level, to overcome the ‘plateau’ in the number of deaths and seriously injured casualties since 2010 across most of the UK. The report also says the Government should not refer to substantial reductions in road casualties ‘over the past 10 years’ without also stating that there has been almost no reduction in deaths or serious injuries since 2010. On the subject of targets, the report concludes that in the countries where the 2020 road safety targets have almost been met, new targets should be introduced as soon as possible – and that separate targets should be adopted for deaths and for seriously injured casualties. David Davies concluded: “This short, factual report confirms the lack of progress in reducing deaths on UK roads over the past seven years. “Uniquely, it compares the trends, on common bases, across the main jurisdictions of the UK (England, London, Scotland, Wales and Northern Ireland) and for the Strategic Road Network in England. It also compares casualty trends for the main road user groups. We might also be forgetting just what makes a driver give less distance? If one looks at it with a wider view its two things. Number one is shown in ‘SEPARATION DISTANCE’ in the DVSA’s own Handbook on Safer Driving and number two is and I am sorry to say Nigel the Police Roadcraft Manual on overtakes. Both of these publications say that at times it’s ok to be closer than the full stopping distance, indeed about the Thinking Distances only behind another vehicle and therefore not the safer Full Stopping or Following on Distances. With these two well known authorities advising or encouraging drivers and riders to break the law it’s no wonder that the Police can not do their job or are reluctant to do it as those publications could be used in defence of a prosecution. Who is going to argue with the DVSA and the Police? PS. Nigel in the standard driving test the candidate will have been told that the safe stopping distance is that in which he or she can stop in if the vehicle in front slows or comes to a stop and that to many ADI’s is the ‘Thinking distance’ and not the distances referred to in the Highways Code. Even some Advanced Motorcycle Trainers now abide by that norm whilst following another vehicle at 30 mph. around town. Yes, Hugh. Problem is most will only have done the standard driving test which is the lowest reference point. Most won’t be able to understand anything above that level. Remembger, most feel they are safe because they haven’t had a crash. But on a scale of vulnerability the figures will often be quite different. Reduce the vulnerability factor and you automatically improve the safety level. If those behind the desks don’t understand this they can’t translate it into policies. It’s the same old turkey, I’m afraid Hugh, but one which on its own would significantly reduce injury and death on the roads because, first of all, it would cause drivers to start taking ownership of their own safety, regardless of what so called safety gizmos are fitted to the vehicle. That old turkey is, space and time. You know the rest. But people sitting behind desks generally don’t understand this. And, it seems they are the ones generally making the policy decisions. Thanks for the correction David. I’ve made the mistake that I accuse others – just reading the executive summary! In my defence, the shift in the balance of risk between those inside and outside motor vehicles seems so significant that it ought to merit a headline of its own, not first appear on page 14 of 28! There seems to be insufficient focus on how the increase in size and safety of vehicles for their occupants seems to have come at the expense of pedestrians and cyclists. I am troubled by our casual acceptance of casualties on our roads. Reducing deaths by (say) 33% seems ambitious, but, even if achieved, would still mean 3 fatalities A DAY on our roads – hardly a matter for celebration. By stark contrast there are about 10 passenger deaths PER YEAR on our railway system and 28 fatalities reported to the Air Accident Investigations Branch in 2017. When road casualty targets are missed, there is no parliamentary inquiry – just excuses; more traffic; wrong sort of weather; different reporting. Surely the target must be the same as for all other modes of transport: zero deaths. To Hugh’s point, the focus on deaths is because it is the only reliable TREND metric that we have. KSIs are distorted by the change in reporting methodology and most slight injuries (?75%) are not reported at all. However, Hugh is right about the need to focus on addressing the systemic causes of ALL injuries. Industries that have focused on safety “near misses” have seen fewer serious injuries. I see no reason why road safety wouldn’t see the same benefits. As a postscript, the refusal by the police to record even quite serious collisions doesn’t help, of course. I’d be interested to know what ideas and principles you would propose Nigel. What’s the ‘one obvious option’ you mention in your first para for example? Commenting generally, PACTS and other road safety groups seem to be fixated only on reducing deaths, whereas the focus should be on reducing collisions generally, as a result of which, there will not only be reduced deaths, but reduced injuries and damage to vehicles and property as well. Aiming for only non-fatal crashes on our roads is blinkered and naive. 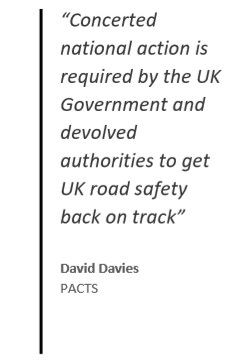 Sorry, but I find it quite incredible that organisations like PACTS are shouting about the urgent need to reduce road deaths when one obvious option is staring them in the face but they simply refuse to recognise it or, don’t understand it. One way and another I have been around road safety in the literal term from way back in the 1970s when it was in the hands of the police local traffic departments. They really did understand what contributed to road safety, or lack of it because (a) they were often amongst the first on the scene (often horrific) and (b) this re-enforced their own training in maintaining safe driver behaviour. A far cry, in my humble view, from those who largely sit behind desk promulgating road safety ideas and policies. No wonder they are scratching their heads because there are ideas and principles which should have been implemented ages ago. It just needs the guts to do it. What PACTS omits to mention is that casualty reductions have disproportionately benefited car occupants. Since 2001, the car occupant share of KSIs has have fallen from 48% of the total to 38%, despite the relative increase in car use. We need to redress the balance back in favour of the vulnerable road user. I support Kevin’s suggestion as one way solution. A second possibility is to lower speeds on urban roads, which comprise the vast majority of pedestrian casualties. Quoting from the other fresh news story about winter driving “Two in five (40%) confessed to losing control of their car while the road was icy, while 22% suffered the same fate while driving through snow. Nearly one in four (23%) said they are unclear on what they should do if they hit black ice, while a further 25% claim they would know what to do, but get ‘confused and panic on the spot”. Those self-admissions seem to illustrate the fundamental problem in that too many drivers are not interested, motivated, concerned or generally bothered to raise their own driving skills to an accident-free standard, whether it’s on ice and snow or any other situation requiring their due care and attention. I can’t think what ‘concerted national action’ could counteract that attitude. As for the downright reckless and ‘don’t care’, I’m with Kevin Barker on that one: “Get the “violaters” off the road for good”. So, concerted national action is required is it. Well lets go back to basics. It’s been said many times but having and holding a driving license should be a privilege, not a right. Get the “violaters” off the road for good. Let’s start by having life bans for drink/drug driving cause its gonna get worse not better. Stamp down on it now like we should have done with phone use! Start using the 14years jail sentences for causing death by dangerous driving and stop being so soft.